In force as of 1 January, 2019, electronic vignette will be introduced for the use of the paid road network. 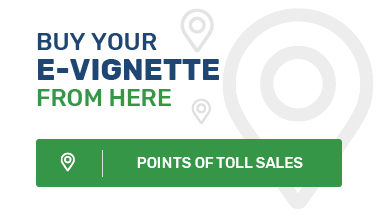 The prices of the e-vignettes remain without change for all types of vehicles. Also, effective from 1 January, 2019 a weekend vignette will be introduced for vehicles with total technically permissible maximum weight of up to or equal to 3.5 tons. With entering into force of the e-vignette there shall no longer be any need to put paper vignette sticker on the windscreen of the vehicle. During a roadside check by the control authorities the owners and the users of the vehicles shall not be obliged to present a document proving the purchase of a vignette. The vignettes for vehicles with total technically permissible maximum weight over 3,5 tons will be valid till 15August, 2019. Effective from 16 August, 2019 a toll charging shall be introduced for them. All paper vignette stickers purchased in 2018 and expiring in 2019 will keep their validity. The drivers should keep the valid paper vignette sticker put on the windscreen of the vehicle till the last date of expiration of its validity.